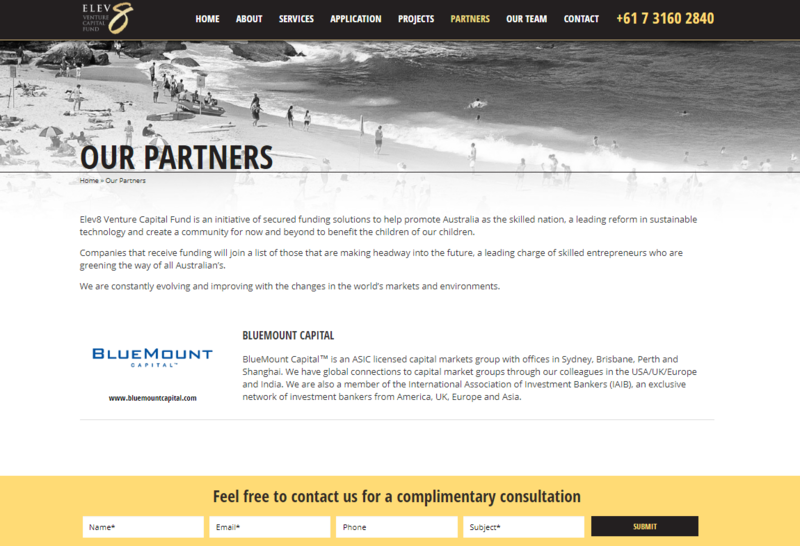 Elev8 Venture Capital Fund is a premier venture capital business based in Australia. Elev8 comprises a number of specialty funds including a sustainable investment fund, a property venture fund and an equity investment fund. The team at Elev8 are highly trained, with an unblemished record of success across both the business arena and as community leaders. Elev8 is dedicated to constantly improving and evolving to meet changes in the world markets, with a successful business system built from their extensive experience. Since its inception in 2007, Elev8 Venture Capital Fund has broadly invested in a range of industries, from initial IPO and start-up companies to those businesses undertaking strategic change. Elev8 aims to fund companies at their early venture capital stages, and is gaining increased market share based on the simple and reliable principles practiced by the Elev8 team. In order to reach potential clients and showcase their successful business system, Elev8 required a new branding strategy including business cards, logos and a professional, responsive website. To achieve all this, they came to the team at TWMG. We offer a range of web development and digital marketing services across Australia, including responsive web development, graphic design and branding. 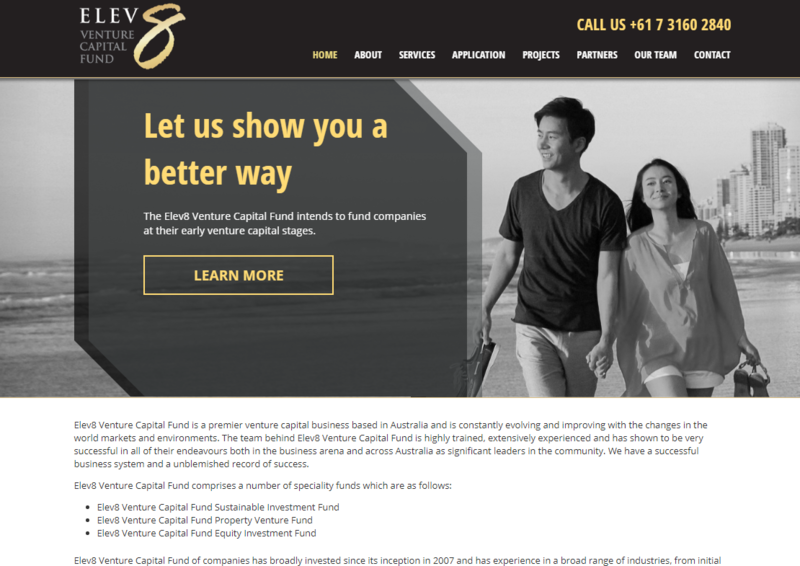 After consulting with the Elev8 team, we began with the logo and branding for the new Elev8 website, creating a design which reflected the expertise and unique standing of the Elev8 Venture Capital Fund. 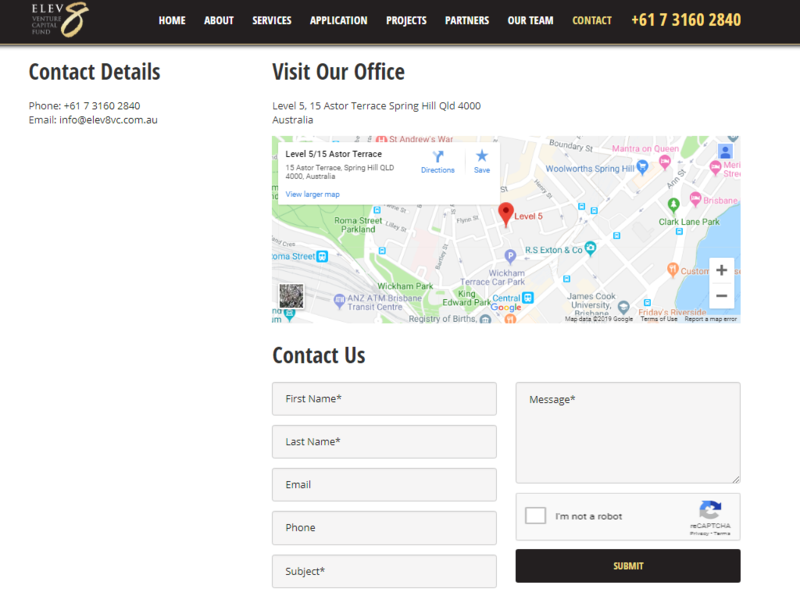 The choice of black, gold and white as the primary colours evokes professionalism, and keeps the website user-friendly and clear for visitors. TWMG also supplied Elev8 with branding guidelines, to ensure that any future changes to the website could be undertaken while maintaining brand integrity. The new Elev8 website was developed using the WordPress CMS (content management system). WordPress is a popular open-source CMS for businesses, used in over 100 million websites worldwide. Not only is WordPress free to install, deploy and upgrade, it is highly customisable, offering thousands of unique plugins and templates. TWMG also recommends this CMS for its simple and flexible interface, which allows Elev8 staff to easily upload content and make changes to the website when required. With the new branding package and website provided by TWMG, Elev8 are now able to reach a new audience across a range of devices, and highlight their years of expertise and success in venture capital. Their logo, website design and business cards have all been designed to reflect the Elev8 brand and create a lasting impression on new and existing clients. 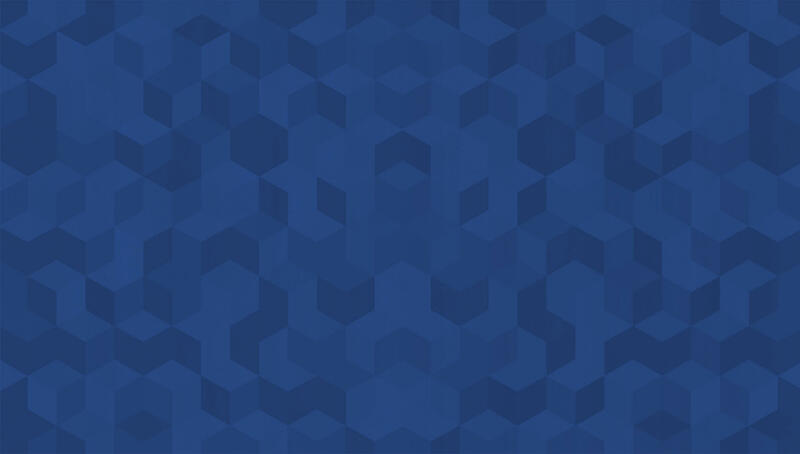 The website itself has been developed with an emphasis on creating a positive user experience for visitors, with information efficiently categorised into About, Services, Applications, Projects, Partners, Our Team and Contact for easy navigation, and the office phone number prominently displayed. With their new website live, the team at Elev8 can now concentrate on what they do best - helping early stage companies develop, create jobs, satisfy needs and disrupt markets in the Australian and global economy. 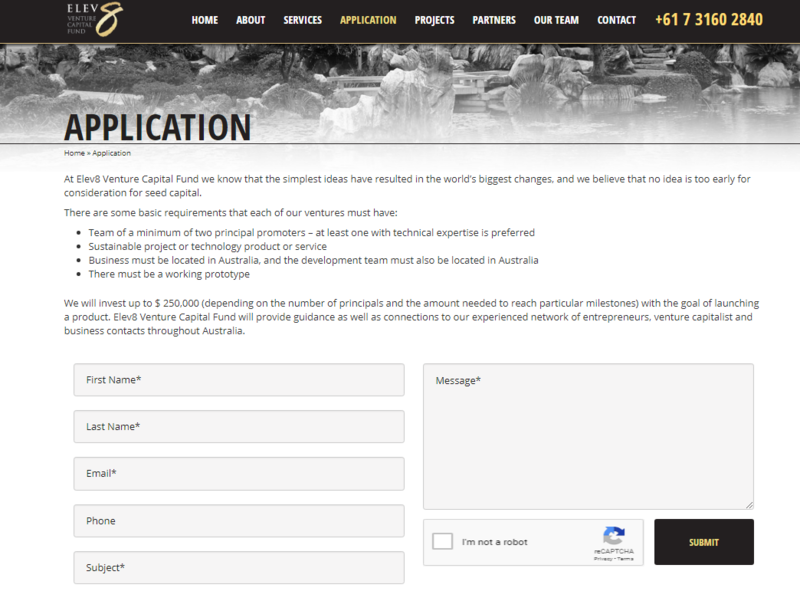 To learn more about Elev8 Venture Capital Fund, visit their new website here. To find out about our range of web development services, click here.